Double header on a Tuesday, Not many would want it, Unless they are willing to see the fireworks of Chris Gayle. First Game, Had one name to be written, Just CHRIS GAYLE… One man literally played against 11 Pune players and won the game hands down. Records kept tumbling as Gayle kept swinging his bat (all those tumbled records are listed below). Ballistic Gayle went on to score 175 runs in 66 balls, which had 13 fours, 17 sixes & 18 dot balls. Other played the second fiddle around him, RCB ended with the highest T20 score 263/5 in 20 overs. PWI played their 20 overs trying to reduce their deficit of defeat, and ended up scoring 133 runs, leaving them just sort of 130 runs from the target. A point to note, Gayle also picked 2 wickets in the only over he bowled. Second Game, After having a Power packed, you can’t eclipse the effort of calypso, So it was always a dull game, where people relived the moments of glory of Chris Gayle and in between there was a match between Delhi & Punjab. Delhi batted first, back to square one as they were in the tournament till the last game, lost wickets to poor shots and poor batting efforts to sum Delhi’s score of 120 in good batting track. KXIP started off the chase in a flyer and kept the chase going even though wickets are falling every now & then. But in the end they chased it with 3 full overs to spare. – Records tumbled as Man from Caribbean took a big page on the record book, Read what all he has rewritten in the books of record. · Fastest Individual Fifty in IPL scored in 17 balls. · Fastest Individual Century scored in a T20 international scored in 30 balls, bettering 34 balls century of Andrew Symonds and for IPL it is 37 ball century by Yusuf pathan. · Longest Six scored which went 119 meters bettering 112 meters also by Gayle. · First player to hit 150 sixes in IPL tournament. · Best Opening Partnership for IPL ever, 167 runs bettering 163 runs between Dwayne Smith & Sachin Tendulkar. · Fastest Team Hundred in IPL history scored in 7.5 overs. · Most sixes hit (17) by any batsmen in a T20 international, Previous best was by Graham Napier for Essex against Sussex hitting 16 sixes. · 175 runs scored is the highest score in a T20 International by an individual batsmen, he bettered 158 runs by Bredon McCullum in IPL season 1 against RCB. · Highest total in a T20 International game bettering 260 scored by Srilanka against Kenya, and 246 scored by CSK against RR in IPL career. · Gayle is the only player to have scored four centuries in IPL career. · 192 runs scored in Boundaries & Sixes is the highest ever in a T20 international. 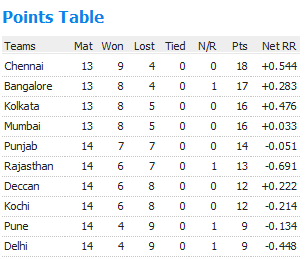 · 21 sixes scored by RCB is the highest ever by any team in an IPL game. – Chris Gayle also scored the 800th Boundary of this season. 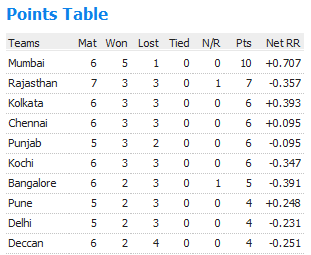 – RCB have won all the 6 games played in Home ground till today for this season. – 130 runs victory by RCB is the second largest in the IPL history, first is by RCB who lost the match by 140 runs against KKR in the first season. – This is third game in IPL won with a margin more than 100 runs. – Fifty scored by KXIP in 4.3 overs is the fastest for this season. – Irfan Pathan became the second all rounder to score 1000 runs & to pick 50 wickets in his IPL career. – Parvinder Awana & Roelf Van de Merwe bowled the 16th & 17th Maiden’s of this season. – Game won by 18 balls to spare by KXIP against Delhi is the highest ever in all the seasons. – Roelf Van de Merwe bowled his first ever Maiden in his IPL career. – After 6 games which was won by chasing on a trot, finally Gayle broke the shackles by winning the match Batting first. Gaylestrom again struck in Bangalore Chinnasamy stadium as RCB trounced KKR in their home ground. KKR rode on their Skipper’s half century and some added support from Yusuf & Tiwary made sure KKR scored 154/8 in 20 overs. Second half almost a one man show as always Gayle found almost every nook and corner of the ground to send the ball. 85 from 50 balls made sure Bangalore crossed the line with enough time. Rajasthan Royals got off to a decent start thanks to ever dependable Wall, who yet again scored a 50. But not much support from other end and wickets at wrong time made sure they made just 145/5 in 20 overs. If its Gayle for RCB, then replica is called Aaron Finch who turned topsy turvy PWI opening slot to power slot. Well aided by Uthappa & Yuvi to finish the game and put an end to their 11 match losing streak. – When Kallis went past 12 runs in the game today, he has accumulated 2000 runs in his IPL Career and also he is the first overseas player to do so. – Kallis bowled the third maiden of this season. – 17th IPL Fifty for Gayle now he is a joint topper with Gautam gambhir for most fifties in IPL Career. – Gayle’s last six went for 106 meters, which is also the longest for this season bettering Thisara Perara’s 101 meters. – 2nd and 3rd No balls are bowled by Henriques & Bhuvaneshwar Kumar respectively and follow up free hits were gracefully despatched to boundaries by Gayle & Dravid. – Kushal Perara became the second person and third time in IPL to be out in the very first ball of the match. – 4th No Ball came from Sreesanth and Free hit was sent into crowd by Robin Uthappa. – Both Gayle & Kohli now involved in ten 50+ partnership, which beats the toppers from CSK who has done it 9 times Hussey & Vijay. – 64 runs scored by PWI in Powerplay overs is the highest for this season for any team. – 1/41 by Bhuvaneshwar Kumar is the most expensive spell for him IPL Career. – 43 ball fifty from Rahul Dravid was the second slowest in IPL career, 44 balls against KXIP in opening season was the slowest. – This is the first win for PWI against Rajasthan Royals in their IPL Career. – Ross Taylor scored the 100th Six of this season. – Harmeet Singh picked his Debut wicket Ross Taylor caught at Deep midwicket. – PWI finally ended their 11 matches losing streak. Match 67, Gilly need to win 5 games out of 5 to in the playoff’s he crossed 4 successfully and he needed just one more to go past for the playoff’s. He won the toss and decided to field first, idea should have been to dismiss Deccan’s cheaply and score the run in quick pace to up the run rate. But what happened was quite opposite as DC’s found form in no time to pull KXIP in the back foot. To say they got themselves to blame, as they even dropped the sitters, not once or twice, almost five catches were put down in their innings and i didn’t count the missed run out chances. Dhawan rode on luck to get to his first half century, well supported by Ravi Teja. 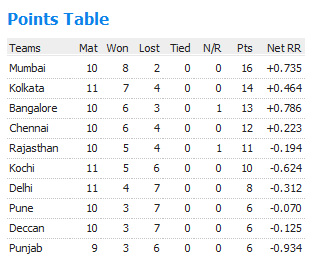 Finally Deccan’s finished with 198/2 in 20 overs, their ever highest against KXIP in all seasons. Must win situation, 10 runs required per over, u expect a fight back from the home team, having put in the blood and sweat to win the other 4 games, but it wasn’t the case again as KXIP batsmen showed no responsibility apart from Gilly, who scored his 9th IPL fifty, just before departing. Amit Mishra a happy bowler who picked up the first Hattrick of the season to delight Deccan’s. As KXIP bowled out for 116 in 19 overs. Deccan’s won the match y 82 runs, their highest ever winning margin in IPL so far. 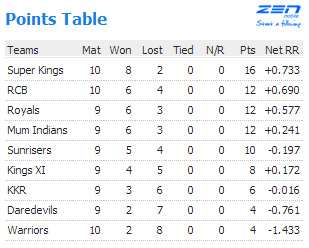 So with KXIP losing, Its now official that top four teams featuring in the list will be playing the playoff’s irrespective of tomorrow’s results. – Gilly scored his 9th IPL fifty. – Shaun Marsh became the fourth player to score more than 50 boundaries in this season of IPL. – Shaun Marsh also became the first player to breach 500 runs mark in this season. 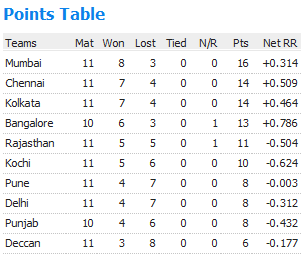 – 82 runs victory for Deccan’s is the highest ever in their IPL seasons, previous was 55 runs vs Kochi in this season. – 198/2 is their second highest ever total in IPL history, list is topped by 214/5 Vs Rajasthan in the first season. 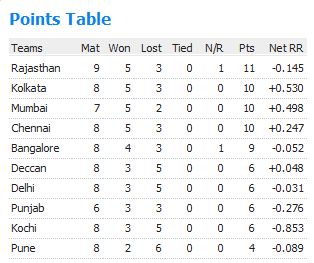 – Out of 6 wins for Deccan’s 5 came batting first and 1 came in chasing. – 95* runs is the highest score for Shikhar Dhawan in his IPL career. – Amit Mishra (Deccan Chargers) picked the first Hattrick of the season against KXIP, personally it’s his second in IPL, ironically his first Hat trick came against Deccan Chargers, for which team he has picked the Hattrick this year. – Yuvraj Singh is the only other player in IPL with 2 Hattricks. – Amit’s Mishra’s Hattrick is 7th in IPL history so far. – This first time in IPL, Delhi Daredevils are the wooden spooners. Match 53, Its the Match Dada will remember as he made his debut for this season of IPL and won the game with a Not out innings. Deccan’s home ground seems to still cursed and they just have one victory in their home ground and it will be till the next season of IPL starts in Hyderabad. Not a gr8 finish for a good start from Deccan’s and few poor fielding efforts let their team down. Ryder, Uthappa and Back in Action Ganguly sealed the game for PWI with 6 wickets and 10 balls to spare, Even though this win does no good nor bad to both these teams, Its a game for DADA fans. 1. Royal Challengers Bangalore 2. 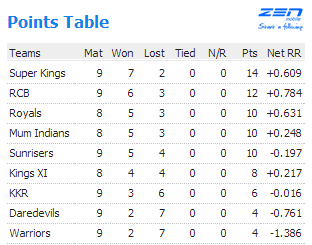 Rajasthan Royals, 3.Kochi Tuskers Kerala and 4.Kings XI Punjab. – Lasith Malinga became the first bowler to pick 25 wickets in an IPL season. – Lasith Malinga is also now the highest wicket taker in IPL, with 59 wickets to his name. – Munaf Patel became the fourth bowler to pick five wickets in IPL 4; other three were Malinga, Harbhajan Singh and Ishant Sharma If ur wondering, Yes, 3 are from Mumbai Indians, just leaving the odd guy Ishant Sharma from Deccan’s. – 76 runs victory by KXIP is their highest victory margin bettering 66 runs victories over the same rivals Mumbai Indians in the first season of IPL. – Mitchell Marsh (PWI) and Bhargav Bhatt (KXIP) picked up 4 wickets each on the same day and both picked up the man of the match for their efforts. – It’s one of the days, we didn’t even see a fifty from anyone of the batsmen even after two full games, Manish Pandey was the closest to come, and who was plumb when he was in 49. – Praveen Kumar bowled the 24th Maiden of this tournament. – Few days back Mumbai Indians recorded their lowest IPL score 94/8 in 20 overs Vs Rajasthan Royals and today they overrun it with 87 all out Vs KXIP, Ironically their lowest total before this season was 116/9 Vs KXIP in the very same ground Mohali. Match 50, Jaywardene locks horns with Vettori, on an important game to keep themselves safe for the coming games. As he won the coin and decided to bat, things looke good when they were 64/1 in 9 overs, but from then, its Men in Green proved too much to keep Tuskars out of the game as they ended with just paltry 125/9 in 20 overs. Later in the match One man with mission Gayle went ballistic once again to give KTK a huge shock as he piled 37 runs in an over, with 4 sixes and 3 boundaries including a no ball. Which literally closed the doors for KTK and its over as Kohli and Dilshan finished the rituals with 9 wickets to spare along with 41 deliveries. Match 51, With 7 loses on trot for Yuvi and a crucial game for KXIP, as Gilly decided to bat first, he wasn’t there to make his decision right but Shaun marsh, Dinesh Karthik and Valthaty tried level best to bring KXIP to 119/8 in 20 overs. Again Rahul Sharma was the key bowler for Pune, as he picked two crucial opening wickets at the right time. A 6 run per over chase was always easy and it was as Ryder, Uthappa and later Yuvi all chipped in to end the 7 match losing streak for Pune. Eventhough they are out of contention for this season, Yuvi was very sure to spoil the party of others. 1. Chennai Super Kings, 2. Rajasthan Royals, 3.Kochi Tuskers Kerala and 4. Kings XI Punjab. – Victory with 41 balls to spare is the tied for the highest along with Pune for this season, personally for RCB this is their second best in terms of balls remaining in IPL, Best was 56 balls vs Rajasthan in last season. – 37 runs scored by Chris Gayle is the highest ever scored in an over in IPL and to take for, in the T20 internationals too, Yuvi scored only 36 runs when he went 6 times over the rope. – Bredon McCullum scored the 1300th Boundary of IPL 4. – Dilshan scored the second fifty of this season. – Praveen Kumar Bowled the 23rd Maiden of this season. Busy Sunday, No time to write or to make up the stats, just piling up whatever comes to be spontaneously. Match 38, Pune with the disaster season, another match to represent their going, Six straight loses, highest by any team in IPL so far. Poor Fielding and pathetic bowling (even after accumulating 5 specialist bowlers) mad it too easy for Rajasthan to win the game with 6 wickets and 3 balls to spare. Match 39, Another game on Home turf where Chennai emerges again out of ashes just like phoenix, to claw back the DC’s and win the game by 19 runs. – Sunny Sohal’s Fifty of 25 balls is the second fastest of the season, best was still with Paul Valtathy with 23 balls. – Sunny Sohal scored the 1000th Boundary of IPL 4. – 64/0 in powerplay overs is the ever highest by DC in this season. – After winning 5 tosses in a row, Yuvi lost a toss for a change today against RR, but his fate of winning the games are not yet back for his side. – This is third match that won with 3 balls to spare, Bangalore, Chennai and Rajasthan today. – Out of 5 wins for Chennai, 4 have come in batting first and all the games are played in Chennai Chepauk in their home turf. – Albie broke through the records of Longest sixes as he went very long with 114 meters in Chennai, just a ball before he clobbered 109 meters as well. To say lucky in the very last moment and thanks to the unknown faces who decided not to watch the match in stadium… Myself and my team got the tickets in the very last moment, in simple an over has been bowled in stadium. Somehow made it to the stadium and without doubt its gonna go down as one of the best match of this season. I just say that only for one reason, Chennai’s fielding… Awesome man, Diving, Flying, Rolling, Mudding, Whatever u name it to stop the ball, it was there, even 142 (a very very par score in Chennai Pitch) looked like 180 odd. I certainly have no doubt CSK could have saved abt 25-30 runs in the field, Which was the match eventually. 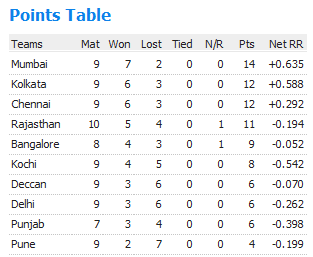 Its such an important win for Chennai as they get right back themselves in Top 4…. – Yuvraj Singh scored his 1000th IPL run. – Mithun Manhas hit the 250th six of IPL season 4. – Chennai is the only team in the league have won all the three matches in defending. – First match in IPL 4, to have all the top four batsmen to be dismissed in the fashion of Bowled. – Ashwin bowled the 7th Maiden of this Season. – Jerome Taylor became the first batsman of this season to be run out of a Substitute fielder and it’s Abinav Mukund who was fielding for Murali vijay’s Leg cramps. – Mike Hussey’s 4th IPL fifty for Chennai Super Kings, got him past Murali vijay in highest run getter for CSk this season, MK Hussey now with 193 runs and followed by Vijay at 180 runs.